For over centuries, tea has been established to be a drink that reaps much health benefits. Its antioxidant property provides a perfect medium for detoxifying one’s body from the toxins concealed in the cocktail of foods being consumed daily and has been associated with a lower risk of any type of cancer. Its soothing effect can calm the most anxious mind and uplift the gloomiest mood. And for weight watchers, tea has also been found to help out in weight reduction and even on lowering cholesterol. But despite the growing popularity of tea as one of the main culprits for longevity among the Asians, many would shy away from the drink because of the bitter, bland taste of tea. While some would appreciate the distinct taste of tea, most people would prefer refreshing drinks with a more c to quench their thirst. Because of the mismatch between the health wonders and the unpleasant taste of tea, many innovations have been created, and one of them is the creation of the designer tea-based drinks widely available today. Milk teas are tea-based drinks with added milk and customized flavourings to mask the bitter taste of tea and to add a stronger umami taste into the blend. Fruit teas are fruit-flavoured tea drinks that add sweet, citrus flavours into the bitterness of tea, creating a more refreshing aftertaste into the drink. 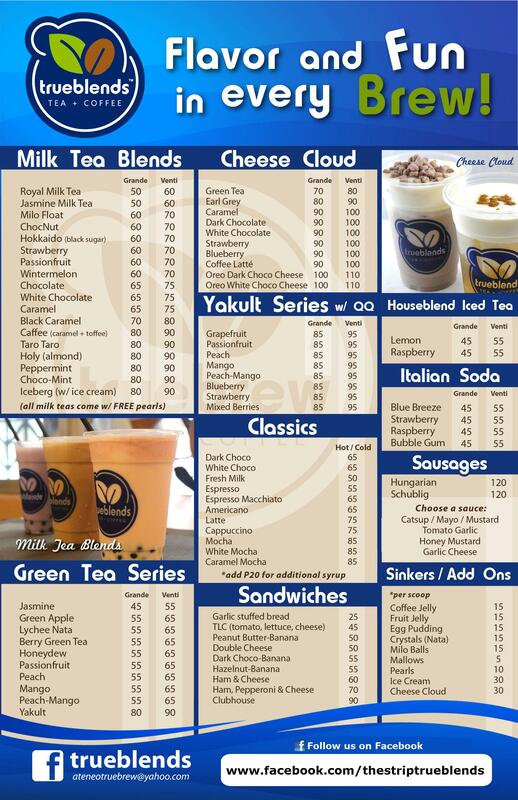 Over the years, a lot of milk tea joints have opened to cater to the different taste preferences of Filipinos. But because preference can vary from one person to another, one tea blend may work for some and but not for everyone. Taking this into consideration, True Blends The Strip Branch decided to embark on a milk tea store that allows customers to modify their tea drinks to their own liking. Although the store offers the usual sugar and ice level modifications, the store goes an extra mile with their teas served with a detachable lid cover so that customers who found their choice of sugar level to be unsatisfying can get their drinks corrected. But that isn’t all that True Blends The Strip Branch offers. With the store’s reasonable pricing, milk tea lovers can get their daily dose of milk tea for as low as 50 php with a free pearl add-on and a complimentary sandwich for as low as 45php. Even the store’s known bestsellers, the cheese cloud series can be availed for less 100php. Because of the affordable pricing, the store allows its customers a regular refuge from the summer heat and helps its consumers acquire the health benefits of tea. Not a tea-drinker? True Blends The Strip Branch also offers non-tea beverages such as its yakult series consisting of yakult-blended drinks and Italian sodas. And like any other café, coffee and hot chocolate drinks are also available for customers to enjoy. Feeling hungry? Customers don’t have to worry about an empty stomach as the store also serves sausages with many sauces to choose from and a variety of sandwiches from the ordinary TLC (tomatoes, lettuce, cheese) sandwich to the unique peanut butter-banana sandwich. 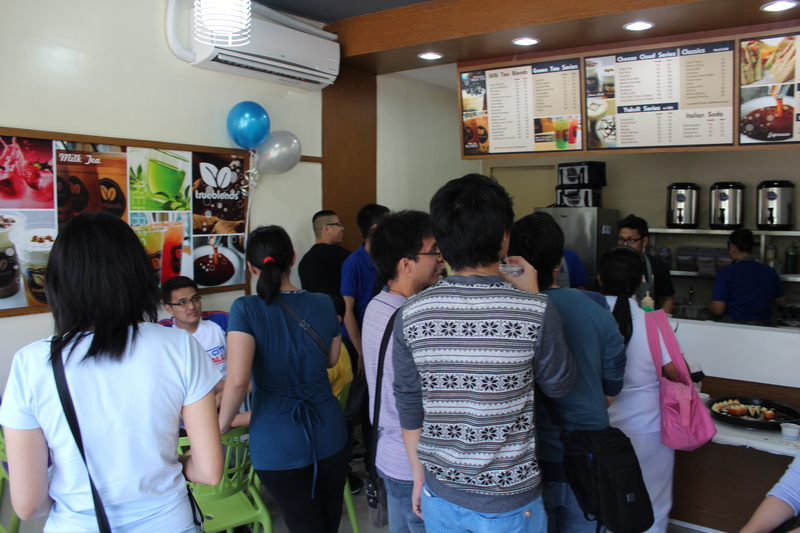 As a newly opened milk tea store, True Blends The Strip Branch is very active in its Facebook fanpage as it seeks to encourage people to enjoy the goodness of tea. By liking the fanpage, the store provides its fans information about their current and future promos and perks to keep the milk tea love on the high. 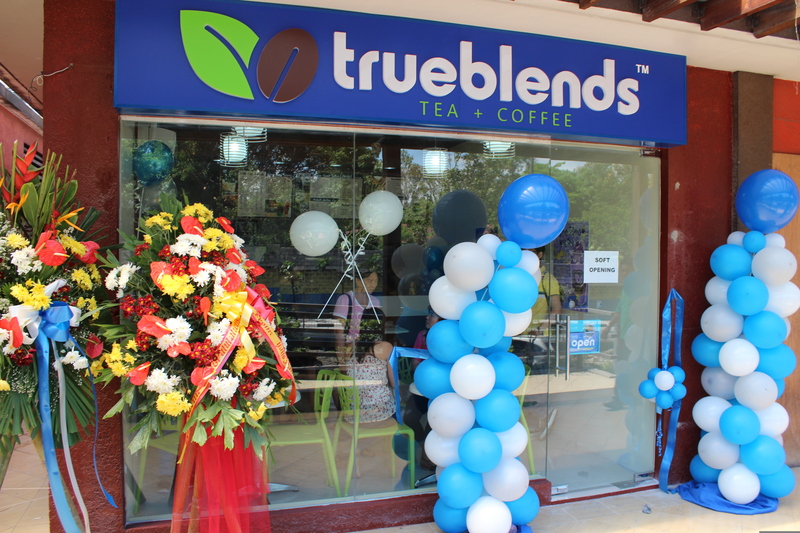 And as a celebration for their soft opening last April 6, 2013, the store is offering all its customers a FREE DRINK UPGRADE until April 13, 2013, providing a perfect opportunity for first-time customers to try True Blend’s signature drinks. True Blends The Strip Branch is located along Ortigas Ave., Pasig City right beside The Medical City to cater to both commuters and passers-by as well as to the regular employees within the area. It is the perfect venue for people who are in need of a refreshing break from walking in the burning summer heat.